Kicker Premium System Front Speaker Upgrade Kit Kicker Premium System Front Speaker Upgrade Kit, Mopar Premium System Front Speaker Upgrade Kit, Mopar 82214735 Kicker Speakers, Dodge Challenger Premium Front Speaker Kit, Dodge Charger Premium Front Speaker Kit, Chrysler 300 Premium Front Speaker Kit [Mopar 82214735 Kicker Speakers] - $264.95 : 3rd Strike Performance, Your Source for Late Model MOPAR Performance Parts and Accessories! Mopar now offers exclusive audio system upgrade components and packages for Dodge vehicles from Kicker, the world's premier high-performance car stereo manufacturer. Make no mistake, these parts can't be ordered from anyone else, including Kicker. These items can only be purchased through the Mopar distributor network. 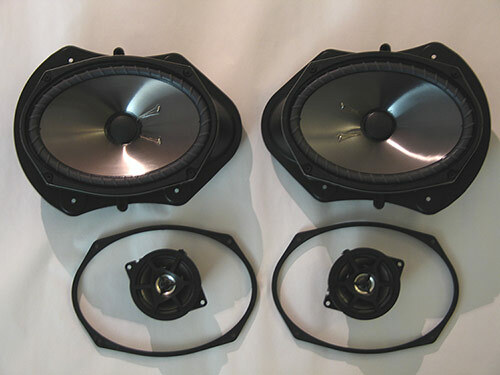 Each subwoofer is based off the highly popular KS-Series build design. Kicker has designed every subwoofer and upgrade package for a specific vehicle application, so no matter what the choice, it will sound great and install with very little effort. For use with models equipped with Premium Audio System.